Each visitor to the Hermitage gets a small piece of clay to model. Whether it is modeled or not, each piece is kilned at a pottery in the neighboring village of Mantamados and added to a clay sculpture collection. From Sykaminea are various hiking trails to the top of Mount Lepetymnos. The circular walking route of Sykaminea via Ai Lias, Kaya Vrysh, Lepetymnos, Chalikas, Agia Anna, Agios Konstantinos has in total 6.7km. The peak of Mount Lepetymnos is omitted at this hike, but the path leads through olive groves, small villages and settlements from where you have a wonderful view of the sea. The bells of the sheep herds sound far through the hilly landscape. 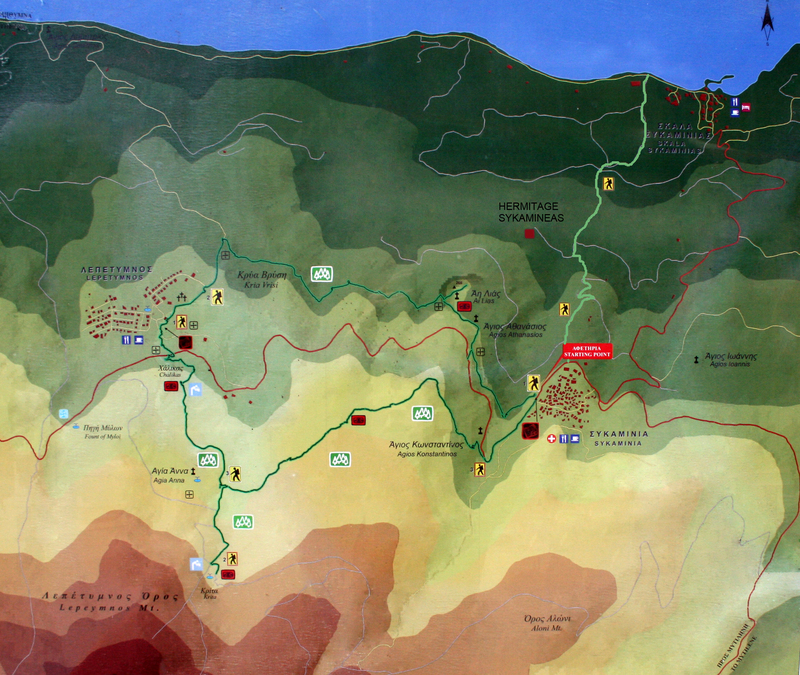 Further hiking trails around Mount Lepetymnos can be found in regional hiking guides of the island, which are provided at the Hermitage. Lesvos is a volcanic island with geothermal fields. They give rise to thermal springs. The Eftalou springs are about 10km away from Skala Sykamineas. The public bath at the beginning of Eftalou beach has one pool with temperature about 46°C and 7 bathtubs. The olive harvest is each November and December. Sticks are used to shake the 60 trees of the Hermitage, then you pick the olives off the ground and take them to the mill in the village of Skala Sykamineas to get fresh olive oil. Some of the olives are pickled. It takes a month until they stop tasting bitter and are ready to eat. There is a small shop with groceries and household goods in Sykaminea. The village square also has a post office, a butcher and two cafés/restaurants. Instead of taking the road you also can reach the villages of Sykaminea by footpath from the Herimtage. In both directions, uphill to Sykaminea and downhill to Skala Sykamineas it takes about 25 minutes walk. In Sykaminea you find a small shop with groceries and household goods. The village square also has a post office, a butcher and two cafés/restaurants. Skala Sykamineas with its small port and adjacent beach Kagia has a plenty of restaurants, cafés, a bakery, a grocery store and stores with local products.